Our 60 acre property had no buildings whatsoever on it when we purchased it. The first building we put up was our house. Sheila thought it was kind of important that we get that done first! But we also need a building for animals’ winter shelter and for equipment and hay storage. 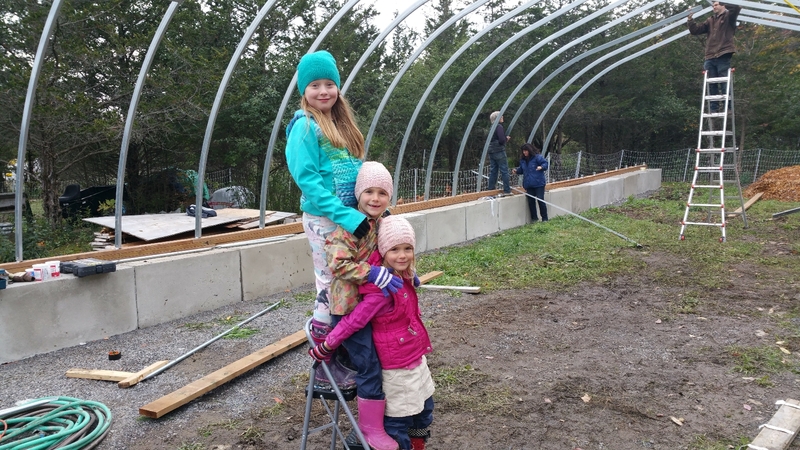 From the early days we have planned to erect a large hoop house to serve as a multi-purpose farm building (our “barn”). 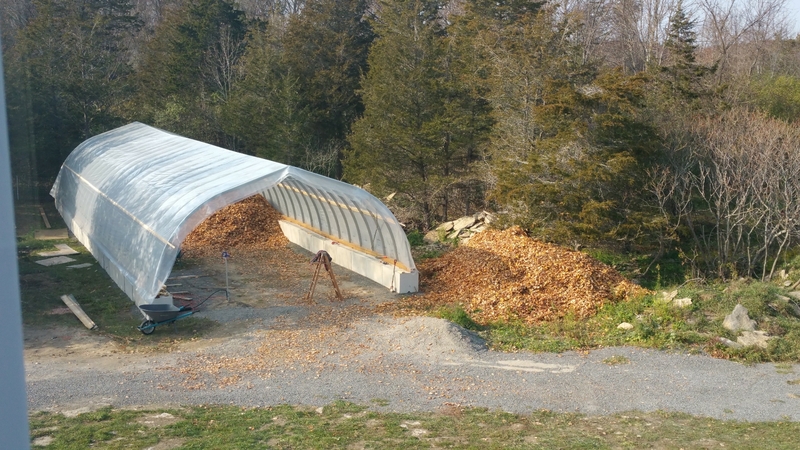 This spring we purchased a kit for a 24′ by 72′ hoop house and planned to get that put up this summer. However, as mentioned in an earlier post, it took three months of phoning and waiting to get someone with heavy equipment to come and place the foundation blocks. We couldn’t do it ourselves because the concrete blocks weigh about one ton each and there are 36 of them! Finally, in October, that happened and we could take over. 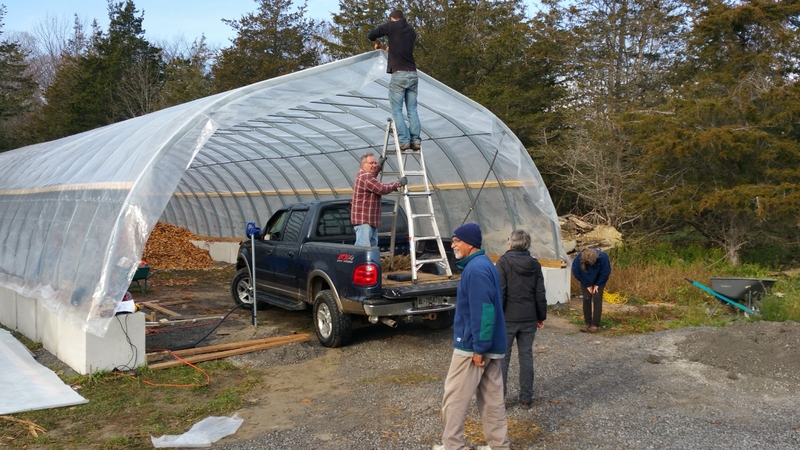 However, a lot of work goes into putting up a big hoop house. 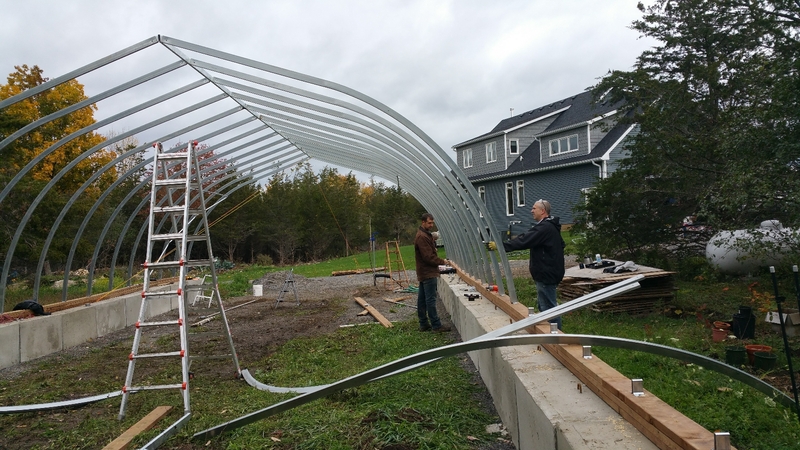 Fortunately, we were blessed to have two barn raising “parties” in the last month or so and we are nearly there! First, the frame, put up by family members when visiting from Alberta, BC and Toronto. Sons Andrew and Jonathan took the lead in putting up the frame. But sisters Joy and Ruth spent a lot of time working on it too. And the grand daughters enjoyed being part of the action. 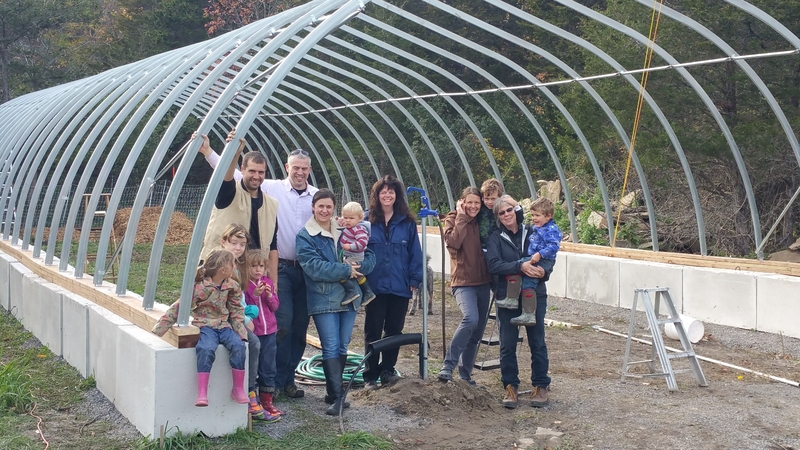 The family crew in front of the completed frame. Putting up the frame was time consuming took a lot of hard work and, thankfully, we had the family help needed (my eyes were at their worst due to Lyme disease those days, so I wasn’t too much use. I am grateful that Andrew headed everything up). The next big step, putting on the sheets of plastic, needed very special conditions; a calm, warmish day (in mid November!) and a half dozen pairs of hands. Even a moderate puff of wind would make the over 1,600 square feet of plastic impossible to hold. The large number of hands were needed to ease the pieces of plastic over the frame (12 feet high at the peak) without tearing it. But it all came together; four neighbours from our Morrison Point, Black River area volunteered to help and, after a number of days with strong wind, our prayers for a calm warm day were answered. 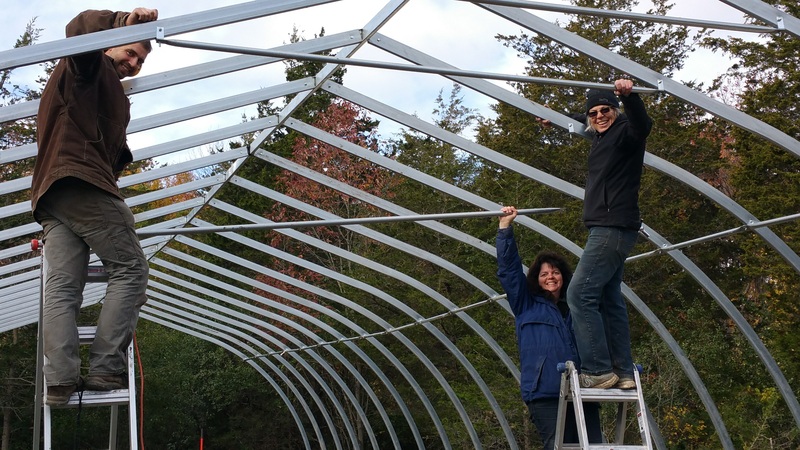 We had a great time working together and, by late morning the barn was raised! The timing was perfect! Within several days, the weather had turned cold and windy with some snow. Even though we still have work to do on the ends, it has been wonderful to have shelter for the animals and 100 bales of hay. Finishing off fastening the plastic at the peak. Thank you Gilles, Pie, Mustafa and Torild! And special thanks to Andrew, leader of the crew. The hoop house as seen from the upstairs bedroom window. The ends still need to be completed but it is already sheltering the animals, bedding, hay plus some of our equipment. So nice to see your family in action. Also not a surprise to see Joy standing on the top rung (“This is not a step”) of a ladder… (grin!). Ann Dickman memorial Sept.9 2-5.